AllClear Dental Centre is registered at the Information Commissioner's Office under reference ZA152547. Click on the link on the left sidebar to find out more about your rights regarding the data we hold. Comprehensive notes of your appointments at the practice including details of diagnostic processes undertaken, treatment recommendations, treatment actually given, conversations between us and any other information considered relevant. Incoming and outgoing correspondence relating to your treatment. For security, the exact method of data storage is confidential but includes backups held on removable drives and offsite backup of certain records. If you wish to know more about how your data is stored, you should contact Nigel Cryer by letter/email using the addresses at the top of this page. It is our aim to minimise storage of paper within the practice. Therefore, all incoming correspondence is scanned on receipt and destroyed by shredding/ incineration after action. Legacy paper records are stored within the practice and will be destroyed after 11 years. When you visit our website, a small text file called a 'cookie' will be stored by your browser on your computer's hard drive. We may use them to identify when you have returned to our website, to understand the services that may be of interest to you, to provide anonymised tracking data to third party applications like Google Analytics and to advertise the practice via the Google Display Network (GDN). The exception to this is when you have given permission for your email address to be used to send you periodic newsletters or special offers via email. You may opt out of receiving these at any time. When you join our membership scheme, you complete an online form. Although this form is accessed via a web address in our domain (www.allcleardental.co.uk/signup), it is operated by Claremont Ltd who collect the direct debits on our behalf. Any information you supply to practice staff in connection with an enrolment to our membership scheme will therefore be shared with Claremont. You have the right to see all information we hold in your records including dental records, notes, xrays and clinical photographs. 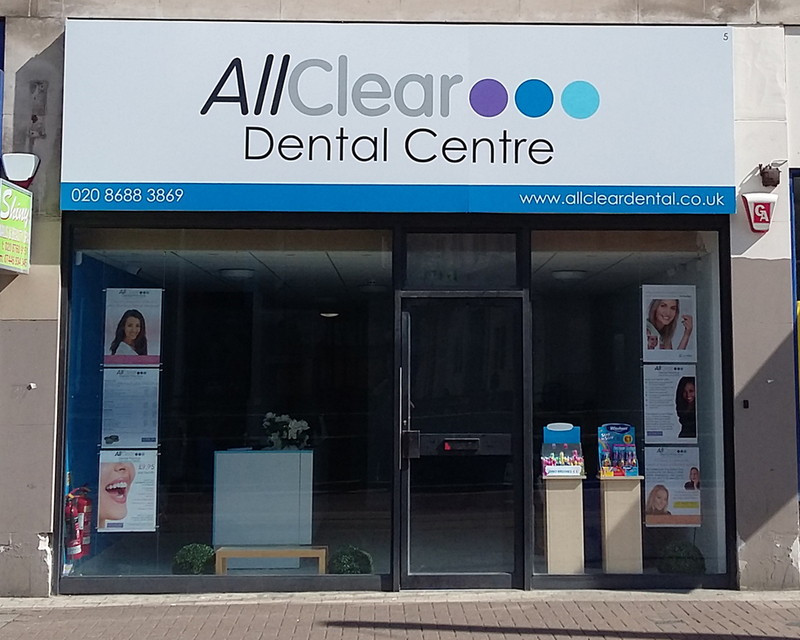 If you would like to do this, you need to submit your request in writing to the address at the top of this page or by email to info@allcleardental.co.uk. It is our policy to retain your dental records for an indefinite period to ensure that, at any time in the future, full details of the treatment you have received are available. This is for your protection in the event of any queries or concerns in the future. The Department of Health advises that dental records should be kept for a minimum of 11 years and requests for deletion of records will only be considered after this time has elapsed from the date of the last treatment at the practice and will be at the discretion of the practice. We may seek legal advice as part of the decision process. Email is not a secure medium and we therefore try to avoid its use for sensitive information wherever possible. You should be aware that communication with the practice via the online forms on our website uses unsecure and unencrypted email and you should not use these forms if you do not want your personal information sending in this way. to provide us with insights about the effectiveness of our ads or the use of our websites/apps, or to create custom audiences for advertising, and in accordance with their Data Policy https://www.facebook.com/about/privacy/. Event Data will also enable Facebook to better target ads and to optimize their systems. In connection with such targeting and optimization, Facebook will: (i) use Event Data collected from this website for ads optimization only after such Event Data has been aggregated with other data collected from other advertisers or third parties or otherwise collected on Facebook and (ii) not allow other advertisers or third parties to target advertising solely on the basis of Event Data collected from this website. Event Data will not be disclosed to other advertisers or to third parties, unless Facebook is required to do so by law. Facebook will maintain the confidentiality and security of Event Data, including by maintaining technical and physical safeguards that are designed to (a) protect the security and integrity of data while it is within Facebook's systems and (b) guard against the accidental or unauthorized access, use, alteration or disclosure of data within Facebook's systems. If you wish to opt out of this type of advert when logged onto Facebook, you can get instructions on how to do so via this link https://www.facebook.com/settings?tab=ads. You can also opt out of Facebook or other on line advetising via the following links www.aboutads.info/choices or www.youronlinechoices.eu/ If you do not want the Facebook Pixel to be picked up by your browser when visiting this, or any other, site, then you will need suitable blocking software. You can find further details of this via a google or other search but All Clear Dental Ltd cannot be held responsible for any damage to your device or the data stored on it resulting from the download of any third party software. The safety of your personal data is our primary concern and there is no link between our practice management software (on which your dental records are held) and our website.